Tan’s relatives (his dad’s siblings and nephew) come to greet JS and Chairman Kim with all the pleasantries they can fake, commenting about Tan and about the Chairman’s health. The girl that Won had that “date” with as his potential marriage partner also comes to greet JS and Chairman Kim with her father. I’m going to call her Yang as that is what her last name seems to be. 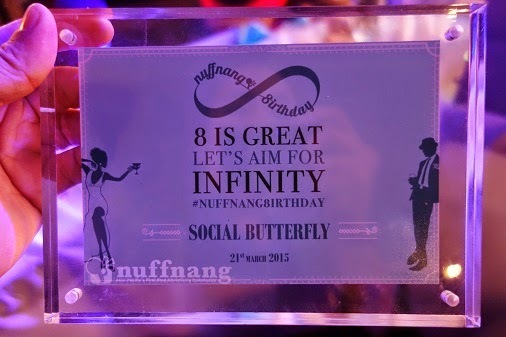 BN and CY are also here at the party, and all of sudden BN exclaims, “Oh my god, oppa? !” She runs over to a man and links arms, which causes CY to frown and get jealous. BN brings in the man over to CY, and CY starts chiding her about linking arms with a strange man. When BN informs him that this guys is her brother, who had been studying in New York, CY immediately puts his claws down, and stands nervously with his hands clasped together in front of him. HS, MS, and BN have a laugh at the expense of CY’s discomfort as BN’s brother puts his arms around him. Won walks into the party, and he sees that Yang woman. They talk separately, and when Won asks if she didn’t bring her boyfriend today, she replies that her boyfriend can’t come to a place like this because he is poor. Instead she brought her rich father. She asks if Won has a girlfriend, and he replies yes. At that, Yang comments that maybe that is why they look good together. Her dad told her to get married to him. Won replies, “We don’t look good together” (in the same way that Tan said to YD before that he and ES look good together in another episode. Brothers, indeed). The woman says it doesn’t matter to her. Tan and ES arrive at the party’s red carpet. Tan leaves the car first. Then ES follows. They stand face to face as the reporters take pictures. Tan asks ES if she is nervous. 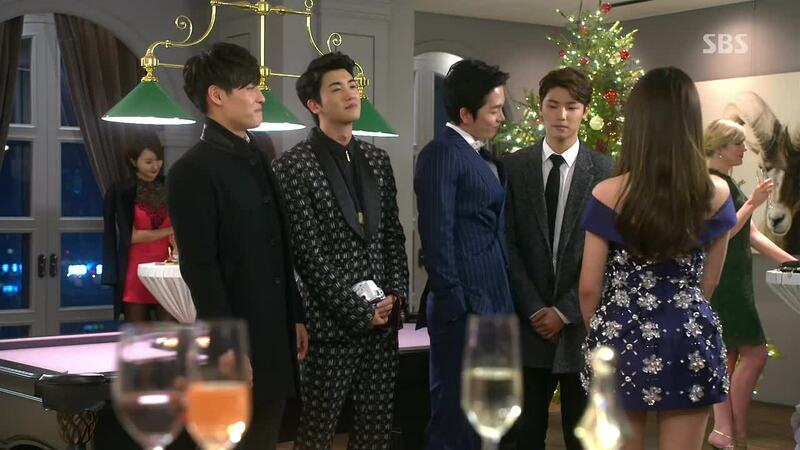 ES replies, “Yes, a bit.” Tan: “It’s an honor because you are here with me by my side right now, Cha Eun Sang.” They hold hands and walk into the party together. They enter the party room, and everyone is shocked to see Tan and ES. Everyone stares, and BN hits CY so he can stop looking at ES. 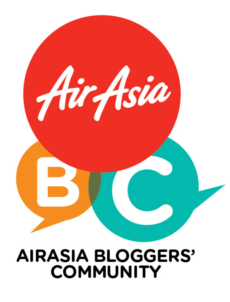 Heh, ever the jealous BN. Reporters start asking for a statement so Dad has them sent away. Privately in another room, he yells at ES and Tan, “How can you appear in front of the cameras like that?” Tan replies he wanted to show off ES to the world; he is no longer afraid of what the world will think of him or his father’s anger. Dad continues to yell, questioning what is great about their feelings for each other when he is trying to give Tan a bigger world. Tan declares he doesn’t want the world that dad is promising him more than ES. He asks for Dad to give them his consent. Dad lets out a big hmph of disbelief. Calming down, dad tells them to go ahead and date. He clarifies says he is not giving his consent- “I believe that you will end up regretting your decision.” Dad also says the same to Eun Sang. Dad also makes it known that he knows that KA is here living in this hotel. He warns Tan to never think that he won against him; he is only overlooking it this time. Dad leaves the room. ES asks Tan if they got consent or were threatened. Tan replies, “Consent that can turn into a threat anytime?” He asks ES to understand his father’s harsh words since it was just his last bit of pride. 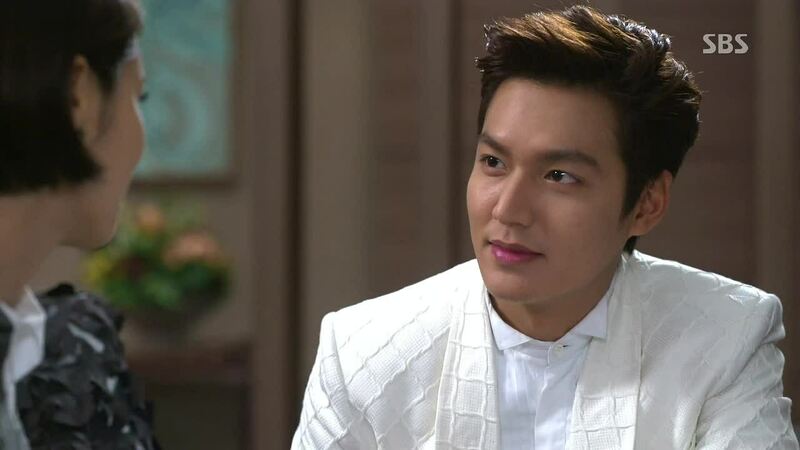 ES nods and asks hesitantly, “Then we…” Tan confirm- “Yes, we have crossed over one threshold.” ES smiles and she bursts out, “Happy birthday, Kim Tan.” Tan smiles back and pulls her in for a hug. They both let out a sigh of relief in each other’s arms. KA is looking sad and lonely in her room, but she doesn’t have to for long as Tan shows up at KA’s door with a birthday cake. 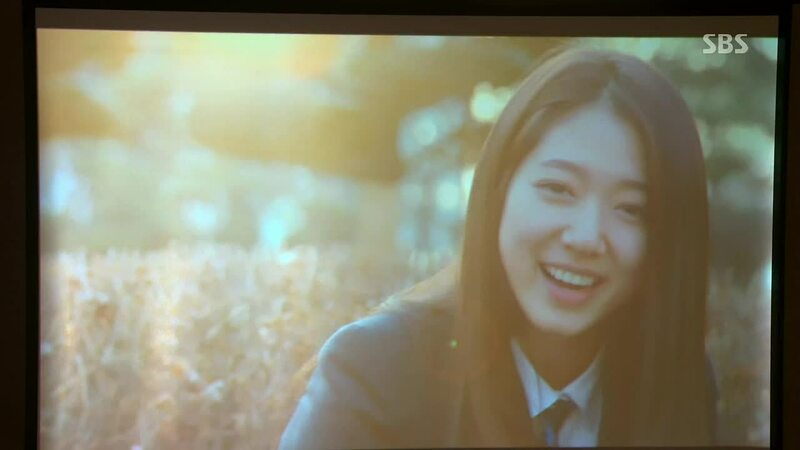 She looks thrilled to see him, as well as Eun Sang. A little worried, though, about the two going to the party downstairs together. KA asks how Tan and ES came back from the party alive. Tan replies that dad overlooked it. KA thinks the opposite- dad lost. She vows not to lose to him too. Tan remarks that he thinks dad is also cutting his mom some slack, since he knows she is living here and hasn’t done anything. Worried that Chairman Kim might come find her, KA asks ES where she and her mom are living now. It looks like she wants to stay with ES and her mom. Next day, KA reunites with ES’s mom with a tight embrace and lots of expression of how much they missed each other. KA and ES’s mom walk arm-in-arm to ES’s house, and following behind, ES calls Tan, asking, “Where is my boyfriend?” On the other side of the line, Tan smiles happily and tells her he has come to see YD. YD and Tan sit across from each other in YD’s room- both uncomfortable, Tan trying to find the right words, and YD dreading to hear those words. YD finally breaks the silence, asking what it is that Tan wants to say. 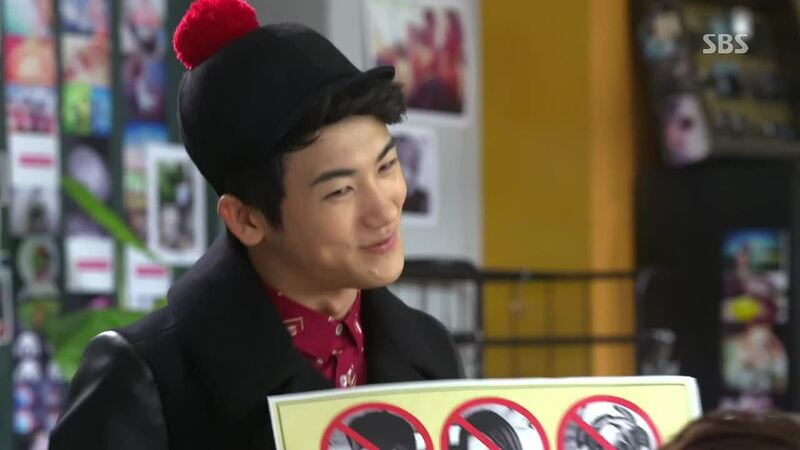 As soon as Tan replies that it is his about his mom, YD demands that he doesn’t. “Let’s not be thankful or sorry to each other.” Tan looks straight at YD- “Thank you. And sorry.” YD throws a little tantrum because Tan saying this to him makes him look bad for being angry at Tan. Tan says that YD doesn’t have to do anything; he is just stating how he feels. As Tan starts to leave, YD calls out, “My mom…I didn’t lose her because of you. She just left first. 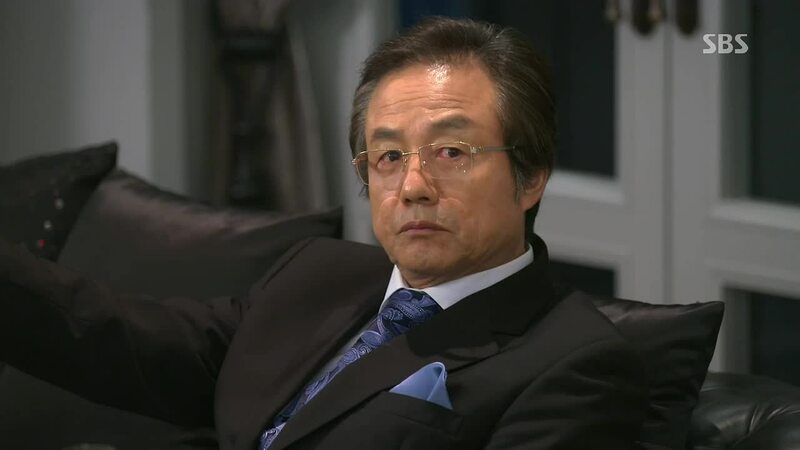 But I needed you to be angry at.” Tan, understanding this as YD’s apology, replies simply that he knows and leaves. YD practices judo hard. His teacher asks him why he is practicing so hard all of a sudden, and YD replies it because he has to beat his dad without cheating. When the teacher says YD can’t win with the skills he has now, YD replies, “I will work harder.” Don’t make me swoon, Young Do! KA and ES’s mom drink together at a restaurant. ES’s mom chides KA for leaving her home when she doesn’t a skill, nor is she young. It’s not going to be easy for KA to make a living by herself. KA, drunk, gets a little angry at that, but she knows what kind of situation she is in very well. She says she is receiving the punishment now for desiring another woman’s house, bag, and husband. She hasn’t been able to be one man’s husband or her son’s mother. Suddenly, KA gets up, saying she is going to the bathroom, and she leaves ES’s mom. Later, ES’s mom finds KA crying her heart out at the beach. She just sits silently next to KA and lets her cry. 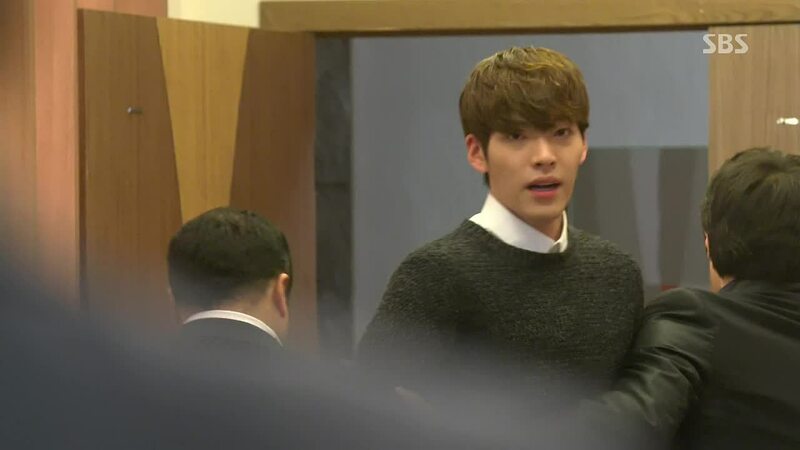 ES walks into the cafe that Tan is at just as he is about to call her, but their meeting is just a coincidence. ES says she is supposed to meet another man here, and at that, Tan, the green-eyed monster of jealousy, jumps out of his seat. Right then, Won, the brother of this monster, walks in. We cut right into the middle of ES and Tan arguing about where ES is going to live. She is planning to move back to her old neighborhood, but both Won and Tan want her to move to the apartment they had prepared for her before. ES explains that she can’t move in to the apartment because who knows what will happen to them in the future- what if they break up? Right now she is seeing him because she can’t live without him, but nobody knows the future. Hahahaha! How could this be sweet, funny, and so cynical at the same time! Tan replies that he too can’t live without her- THAT is their future. 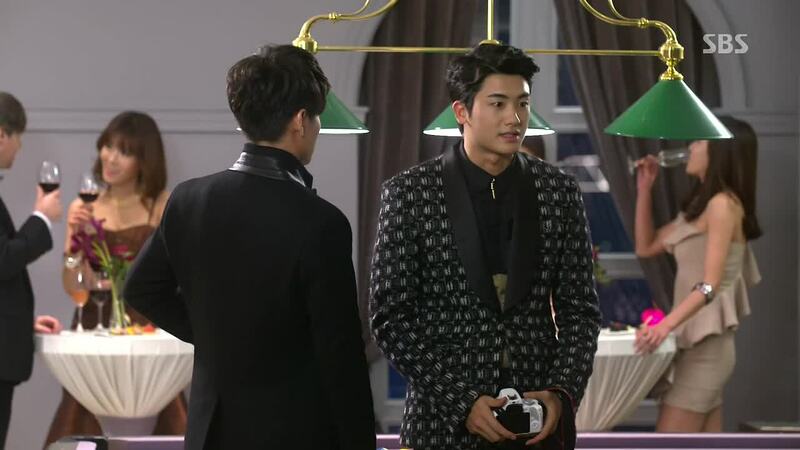 Won tries to jump in to stop this nauseatingly sweet argument, but Tan tells him that he’s got this. Tan turns back to ES and asks if she is really going to be like this. ES replies, “Where is the guarantee that we will be happy forever? I might kick you to the curb too.” Tan won’t have this anymore, so he grabs her hand and takes her out of the cafe in a rush. 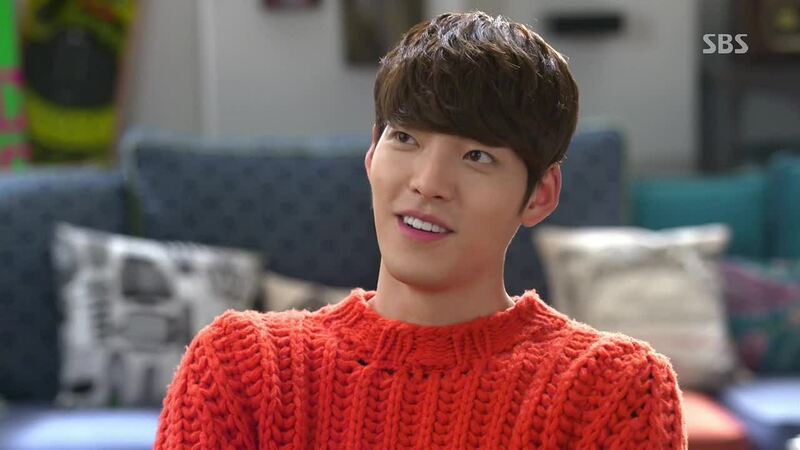 Won can only laugh at the young couple’s lovers quarrel at first, but his smile fades away as he sighs, perhaps thinking about Hyun Joo. Tan has brought ES back to her house. They kneel in front of ES’s mom, and Tan apologizes for the worries he caused so far. He promises that things like that won’t happen in the future, and informs ES’s mom that he has gotten consent from his dad. 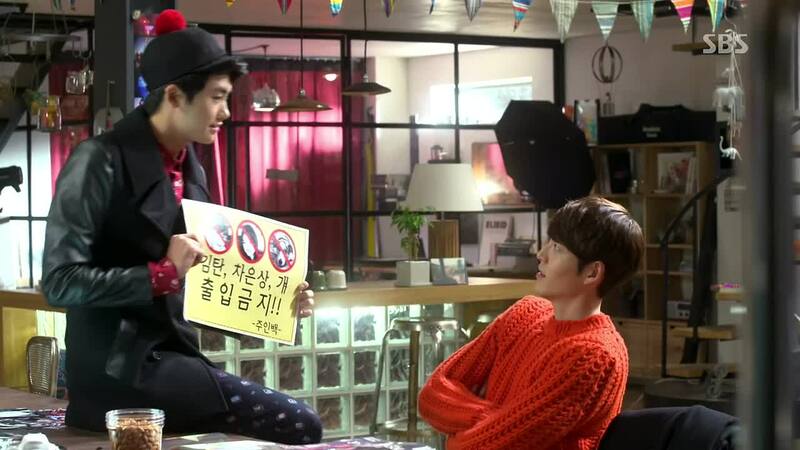 Now he wants her permission so that he can formally date Eun Sang. When ES’s mom doesn’t respond, KA bursts in the room (and ES and Tan stare at her because they are surprised by what she is wearing). She’s indignant that ES’s mom seems to be against her son. ES’s mom starts signing that she can’t give her consent because ES has been hurt so much. She doesn’t want to get involved with KA’s family anymore. 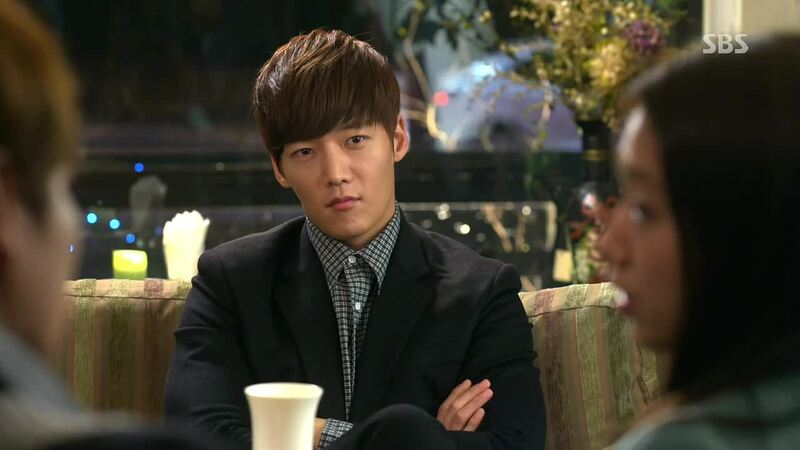 KA angrily replies, “My son is handsome, tall, good, and risks his life on all things regarding Eun Sang. 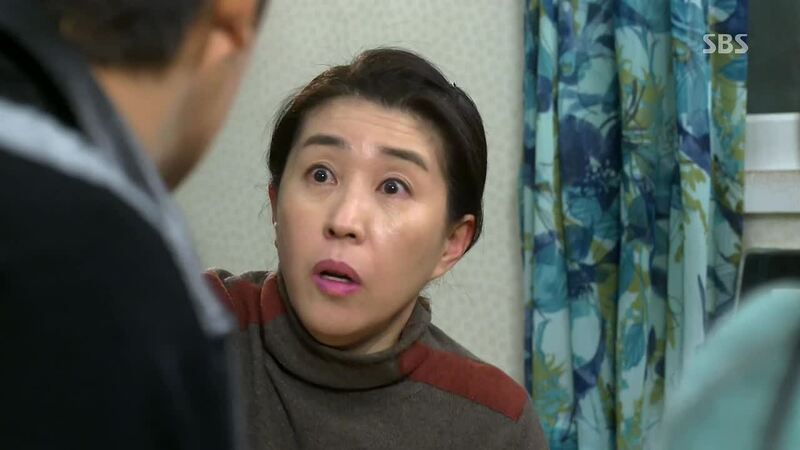 My son is more dear, but why are you saying no?” ES’s mom counters that Eun Sang is pretty, good, and smart on top of that. When Tan asks ES what her mom is saying, as mom continues to sign that ES has a curfew now, ES lies to him hat her mom only said ES needs to be brought home on time, and that only holding hands is okay. ES’s mom raises her hand to hit ES, but Tan throws his body in front of her, taking the blow. Obviously ES’s mom can’t hurt Tan much, but the two stare at each other surprised, not knowing what to do. ES urges Tan to do what he does best, and Tan dramatically falls to the floor, wailing. He pretends to be in a lot of pain and whimpers he will be fine if mom gives her consent. KA adds that he should file charges against ES’s mom if she doesn’t. Knowing what Tan is doing, ES’s mom hits Tan again and then silently goes back to folding laundry. ES thanks her mom, and Tan leaps back up off the floor and thanks her too. A small smile appears on mom’s face. KA smiles too and sits down to help ES’s mom with the laundry. ES is moving to her old house, and she is surprised to see Tan coming out the building. His response- “Why, did you think I come out in fairytales?” Pfft! Tan leads ES into the house with her eyes covered. He’s prepared a sweet event for her, compiling a video of her and projecting it onto a screen he has set up. He hugs her from the back, and they watch it together as ES’s eyes get teary. Instead of talking about how moved she is by this surprise like Tan wants, ES just says she looks pretty on camera. She reminds him that she prefers horror over romance, “or something like this.” She gives him a peck on the cheek- “a thriller.” The two joke and play around as two people in love would do with no adult supervision. Or at least what young people in a k-drama would do without any adult supervision. 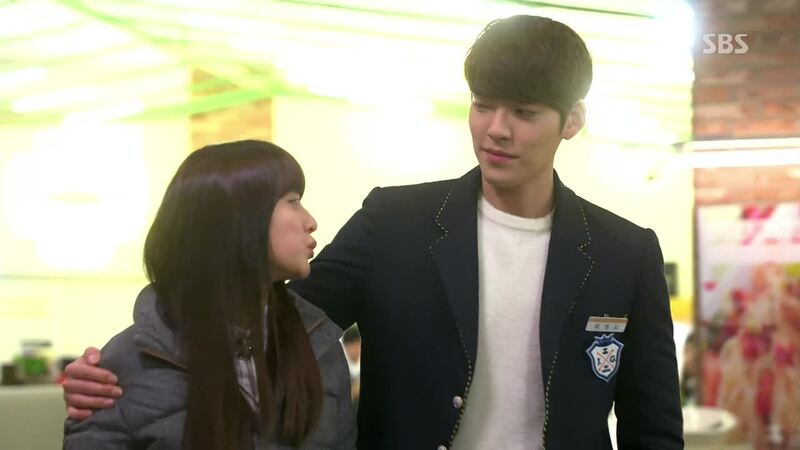 Inside the school cafeteria, R bumps into YS, but in usual style, she doesn’t apologize. The other girls jab at R, saying she has no manners because her family is like that- both mom and daughter had their engagements called off. 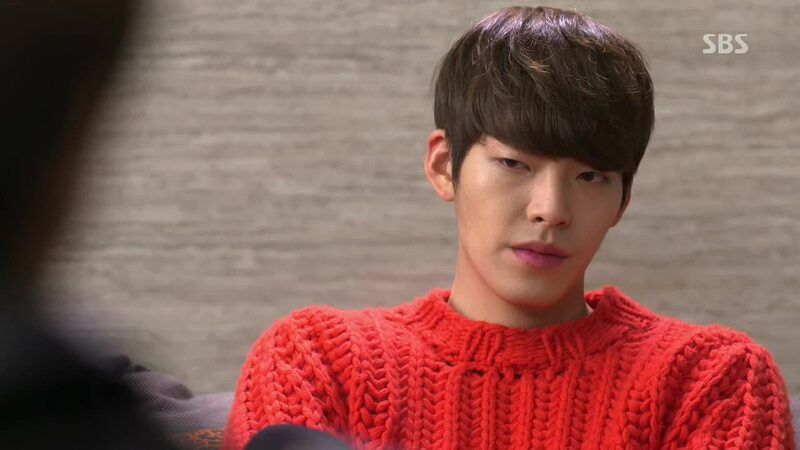 When R gives them the death glare, the girls scoff, revealing that they backed down before because she was Kim Tan’s fiance, not because they were actually scared of her. At this, YD, who is at the next table, slams his spoon down and growls, “How about being Choi Young Do’s little sister?” Scared, the girls scurry off. Outside, R points out that the kids are not as scared of YD as they used to be. Tan replies that he still is effective enough to be able to save his sister. R asks why she is still his sister. Y: “Because I’m going to be your brother. 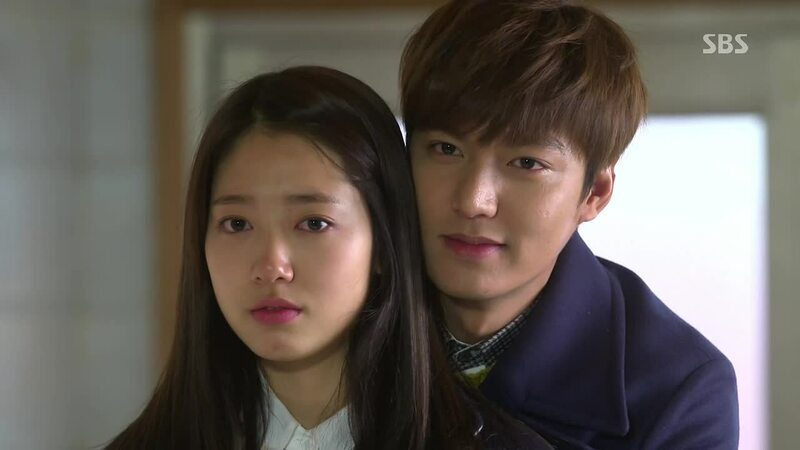 Lean on me sometimes.” R responds that YD must have a lot of time these days; did he end it with Cha Eun Sang? YD replies that there was nothing to end since he doesn’t need the other person’s approval or opinion. It over when he ends it. R asks how YD’s company is doing, and YD says good for now. R hopes that nothing happens for which she has to comfort him about. She goes to class. YD sees ES, but while ES is about to say hi to him, he just walks past her, like he said he they should. The final exams results are out! BN runs up to ES to tell her to stay away from her for now as she doesn’t know what she will do to her if CY’s rank dropped because he was worried about ES. However, nobody can see the ranking because Kim Tan is covering the whole poster with his body. When he sees ES, he tears it off, and tries away with it. But ES calls him back, yelling,”You said you would always be behind me!” Tan, one to keep his word, stops, and tell her to go in front of him. 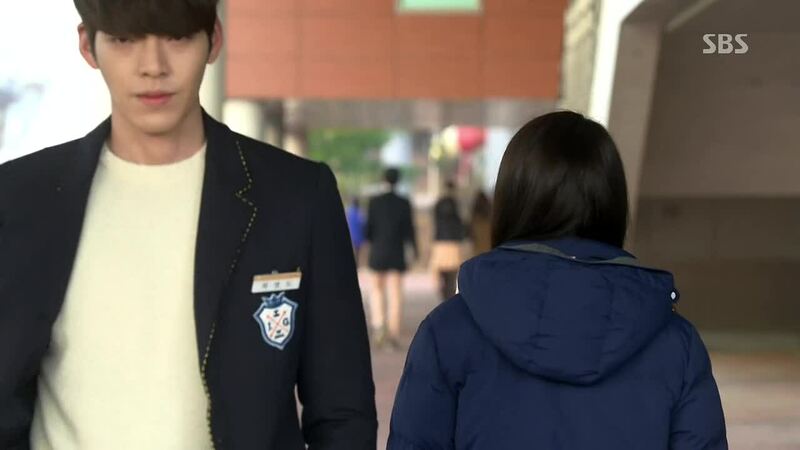 As Eun Sang walks past him, she steals the crumbled up poster from Tan’s hand. She dashes off with Tan chasing after her. Tan and ES continue to bicker outside (Tan reveals he was scared to see his rank), and seeing that the results are folded inside ES’s wallet, he steals the wallet from her. ES doesn’t have time to get it back because of a text she receives. 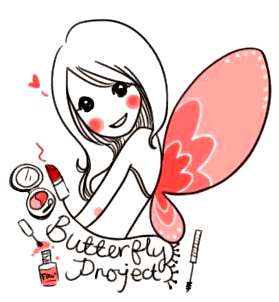 CY has uploaded the poster image to a chat room for the students to see. The other students are laughing their head off in the chat room because MS placed last. 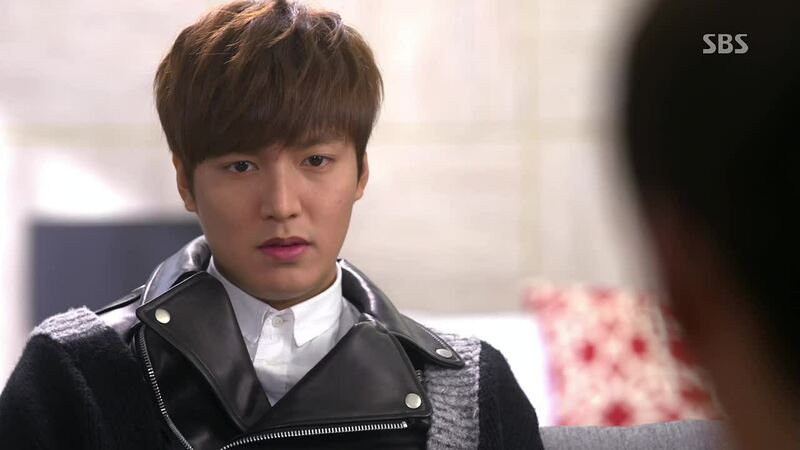 Kim Tan finds out that he placed 50th, finally finding some middle ground in his life. Ha! 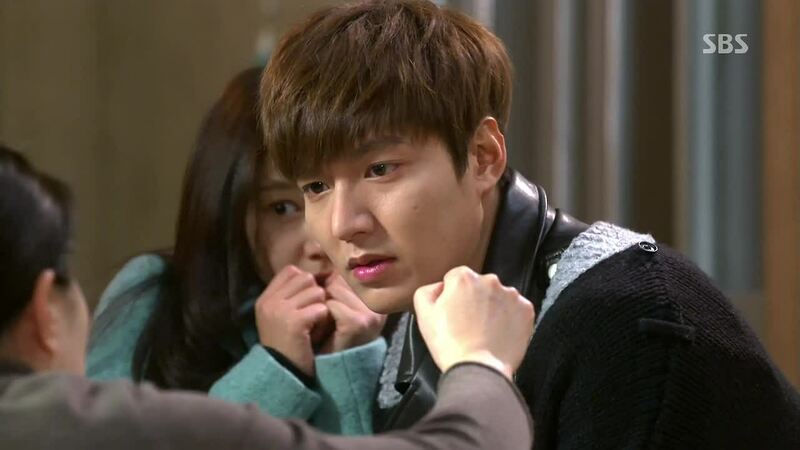 ES informs him that YD placed 27th, complimenting YD, and Tan gets jealous. She also compliments CY, and he gets even more jealous. He asks what place ES is in, but ES runs away. He chases. YD and dad have a judo match. YD wins, without cheating, finally beating his dad. His dad, conceding to the defeat, asks Young Do, “What do you want?” YD replies, “Mom. Tell me where she is.” Dad says he can’t tell him because he doesn’t now. YD replies “That’s fortunate” because at least his dad hasn’t been hiding her from him. YD is at the ddukbokki restaurant again, and the lady working there sees his name plate ,and gives him a business card left for him by some woman. YD recognizes the name on the business card as his mother’s. And the brunch cafe she is working at is called “Secret Garden.” Haha. We also see that Young Do has actually written down his response to his mom’s question on the wall. At school Tan stops BN in the hallway. He asks if BN knows what style of things ES likes. In the broadcast room, BN, ES, and HS have a meeting. They are planning something with another school. BN and ES agree to meet up with the kids from the other school, with BN pointing out how good looking they are. 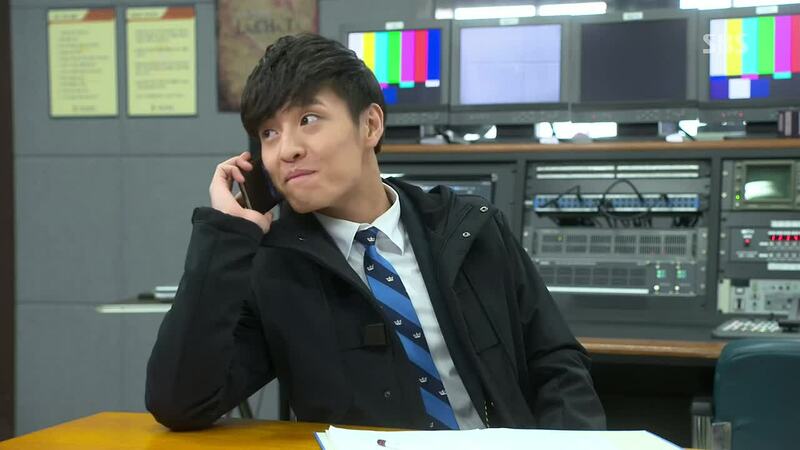 After they leave, HS immediately calls Tan and CY, giggling over the ruckus he is going to cause. ES and BN are meeting with two male students from the other school at the café. The other boys are flirting with ES and BN, who seem to be enjoying it, when Tan and CY show up. Tan calls out “yeobo” (meaning “dear” and also between a married couple). 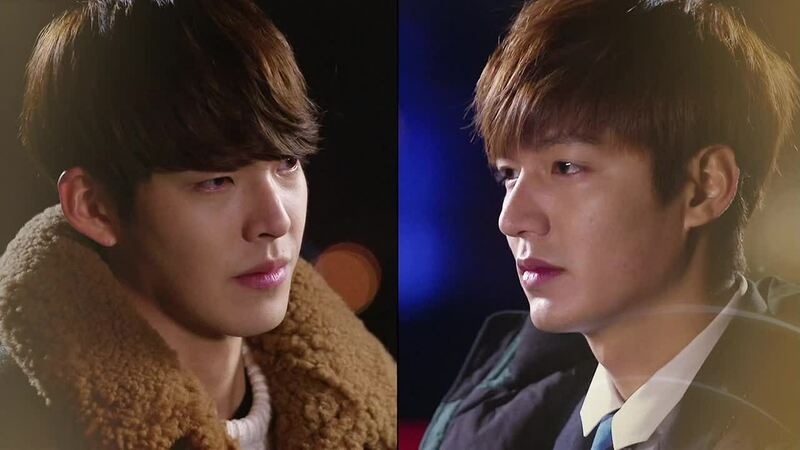 He tells the boys that Eun Sang is married, and CY tells them to never contact BN. What an adorable sight. BN, CY, ES, and Tan would be having a double date except it’s not. Insults, blame, and compliments go back and forth among the four as each one is angry with the other’s partner. Somehow, though, the conversation ends with everyone making fun of Tan. Oh, my poor Tan! Hehehehehe. Now off by themselves, Tan and ES continue to bicker- Tan jealous of other boys even thinking about ES, and Tan claiming his affection for her is pure, as well as his heart. Pouting, Tan walks away and ES yells out to him, asking him when he will give her back her wallet. He replies now and throws her a bag. He declares that he is so happy because they are fighting because of things like this, not because of the circumstances surrounding them. “Let’s fight like this everyday.” Tan waves goodbye and leaves. ES opens the bag he gave her and finds a new wallet inside. Ha! 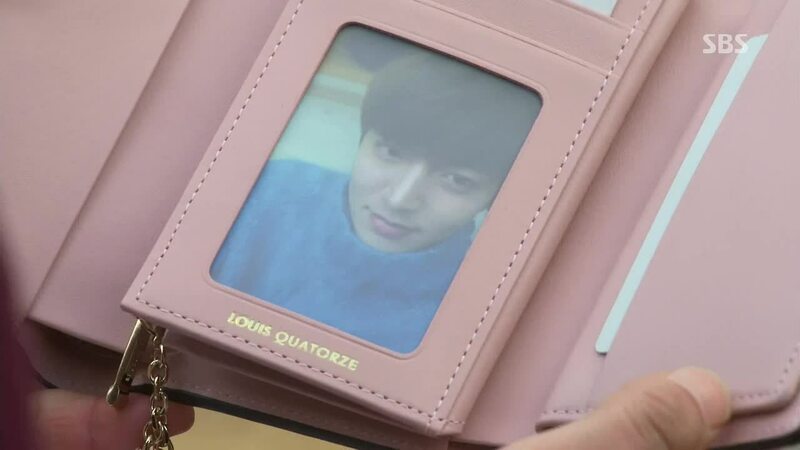 It has Tan’s picture in it, always there for her to see and be reminded of his watchful eyes. KA and Tan share a drink, with Tan saying KA is now his dad too. Tan asks when KA will move into the place Won offered. KA says she doesn’t want to live there- she has no desire for a nice house anymore. 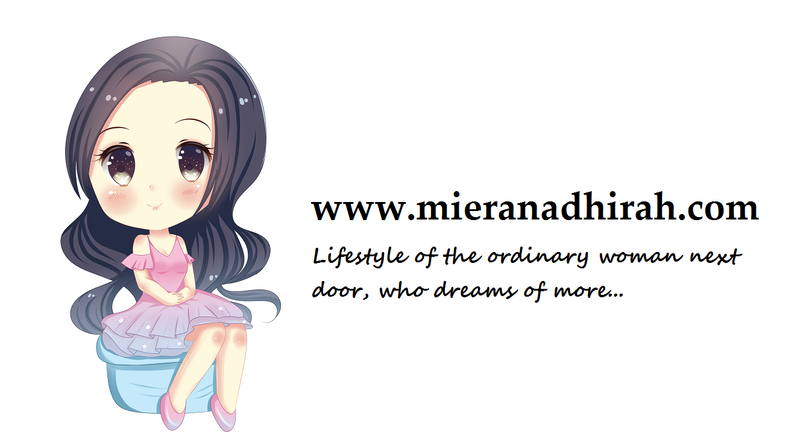 She just wants to travel everywhere on her own two feet, seeing the sky from all over the world. 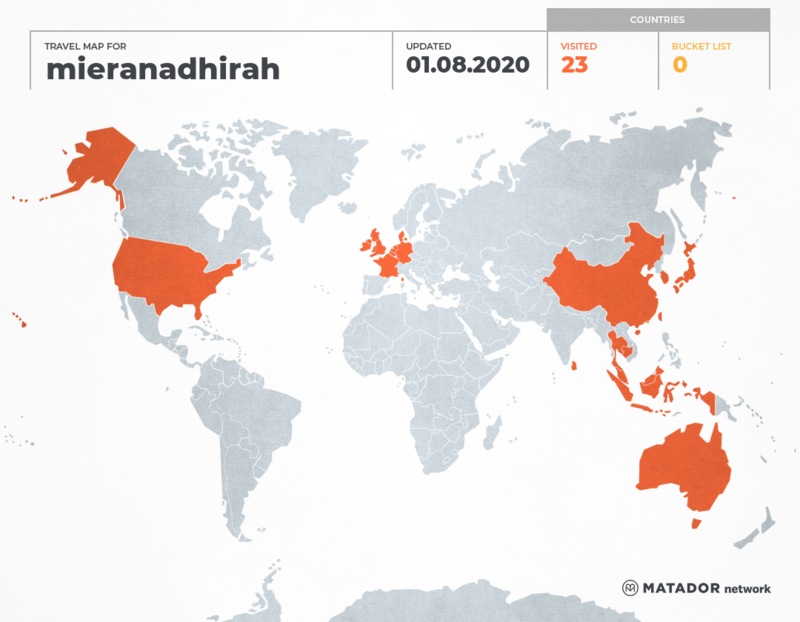 Starting off, she will walk Gangnam tomorrow. Tan offers to walk with her tomorrow, holding hands. KA accepts, but add that after then, he should go back to his dad. His dad is all alone in the house. Tan refuses. Daddy Kim is alone in his house, and he has a dizzy spell. He then sees an image of high-schooler Won walking into the house, cold and unresponsive to kid Tan who is chasing after him. Kid Tan runs to his dad for a hug, but Chairman Kim can’t hug Tan because Won is looking. The memories fade and the dizziness returns. Dad collapses. Chairman Kim has been rushed to the hospital, and all three- Tan, Won, and KA- rush over. The doctor tells everyone that Chairman Kim suffered from a cerebral hemorrhage, and they can’t do surgery unless he wakes up from the coma. All they can do is hope he wakes up for now. KA holds anxiously onto Daddy Kim’s hand. Won and Tan look worried and teary eyed. JS is in her office, looking conflicted. Her brother comes in urging JS to move now to remove Daddy Kim and Won from Jeguk. He reminds her of what she suffered for all those years, and that is time for her to get her compensation. JS is well aware of that. Yoon talks Won and Tan. He points out the if Chairman Kim continues to be in a coma, his voting rights (as a stockholder in Jeguk) will be passed out to JS. Won already knows. He predicts that JS will also open a stockholders’ meeting to put Chairman Kim’s dismissal up for voting. KA sits by Chairman Kim’s side. Tan comes in and tells her to go home. He informs her that something might be up with JS, and he doesn’t want her to meet with JS here. KA understands and leaves. Tan sighs. JS is talking to Tan’s relatives, saying she doesn’t trust that Won and Tan will be able to take care of the company. She reminds them that the company could have belonged to them too; Tan’s father won the company after a war with them. But no winner lasts forever, and the war can be started again by the person who can win. She tells them to line up behind her. YD sits on his room with his mom’s business card in front of him, thinking. Still undecided, he goes to the hotel kitchen to wash the dishes. Suddenly, the other employees begin to whisper about something. YD, overhearing the word “investigation,” runs to his dad’s office. He finds a bunch of men packing up the files from his dad’s office. YD tries to stop them, wanting to know what is happening. But his dad tells him to stop and leave, not wanting his son to see him like this. In another part of Seoul, Tan sits in a dark hospital room, watching over his comatose father. Hesitant at first, he slowly takes his dad’s hand. JS enters the hospital room. When Tan points out that JS is late, she explains that she had a lot of things to take care since it is unlikely that Chairman Kim will wake up. Tan declares that he will. Won comes in. JS looks at Won and Tan- “Seeing you guys now, you two are very similar.” She leaves. Won tells Tan not to worry about whatever JS said; he is not at that age yet. He tells him to go home and rest for today. Tan’s back at Zeus hotel to go see his mom, but while on the elevator, he thinks about what JS said to him. Needing some air, Tan heads to the rooftop of the hotel. He looks out onto the flickering lights of the city below. He then notices that YD is there on the roof too. YD notices Tan also. They look at each other for awhile, silent. No words need to be spoken for them to understand why each one is here. They break their gaze with each other and look out into the city once again. Each is lost in their own world, burdened by the continuing trials of growing up and learning that their parents are just as fragile as they are.